Pool insurance isn’t something most pool owners would consider when thinking about the cost of pool ownership. But it’s worth considering the risks associated with having a pool and whether your home and contents insurance is going to cover them. First up, this isn’t financial advice. We’re not professional insurance advisors, so read this article as information only, not advice about financial products. Secondly, every home insurance claim is different. And thirdly you should read and understand the terms and conditions in the Product Disclosure Statement of your home insurance policy. If you don’t have a copy of your Product Disclosure Statement or you’re not sure of the details in it, contact your insurance company ASAP. In fact the best way to determine whether your home and contents insurance policy includes your pool is to call your insurance company and ask. They’re all going to have different rules and policies and their insurance products are probably slightly different. Here’s the main reasons why you should think about pool insurance. Obviously pools require maintenance to keep them operating properly and to prevent serious damage. But if there’s damage that’s not caused by wear and tear, that is accidental damage, then it’s worth thinking in advance as to whether your insurance would cover it. Maybe a large foreign object falls (or drives!) into your pool causing damage to the tiles or the pool lining. 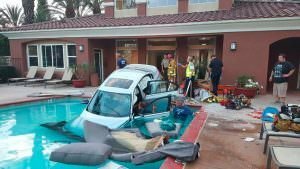 Remember that time a car accidentally drove into your pool? No me neither. Wonder if insurance would cover this damage to your pool? It’s unlikely that you’re going to make an insurance claim for pool toys, because let’s face it most of them would cost less than your excess to simply replace them. I’m thinking here more along the lines of the expensive equipment like the pool pump or the solar heating. Say a storm damages your roof and in the process damages your pool solar heating pipes. Would you contents insurance cover this? Or maybe during the storm a tree falls onto your pool pump and filter. Even a fancy robotic pool cleaner could fall prey to accidental damage and be costly to replace. Would your insurance cover this type of equipment damage? Your pool fence is a considerable investment. Especially glass pool fencing, it looks amazing but it costs a lot of money. If there’s accidental damage to one or more of your glass pool fence panels, the cost to fix it would quickly add up. That’s my thoughts on the types of things that might need insurance concerning your pool. Are they covered by home and contents insurance policies? 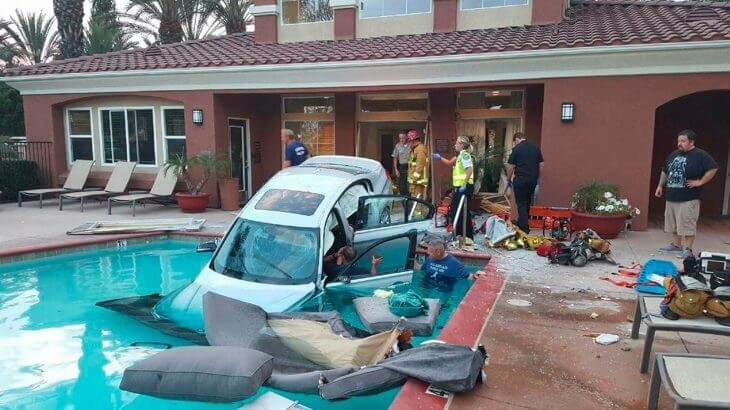 Is there specific pool insurance available? I’ll reach out to the major insurance companies and ask these questions, then I’ll report back on what I find out.